After you next round of golf, I want you to think about something. For the price of a 19th hole beer (or an Arnold Palmer if that’s your preference), you can take 3-5 strokes off your score. Seriously. It’s all on the up and up, too. No cheating or bribing here. I’m talking about homemade training aids for golf. They’re inexpensive, easy to use and effective. Whatever your weakness on the course is, there’s a homemade training aid to help you. I’m going to give you the lowdown on a few of them. All of these are professionally tested and proven to work. Perhaps the best homemade training aid out there is called the Tour Striker Smart Ball. European Tour Ryder Cup Captain (and major champion) Darren Clarke is a believer—as is LPGA Tour player Belen Mozo. At first glance it may not look like much, it’s an adjustable lanyard with an inflatable ball at the end of it, but it’s going to help you swing so much better. To use, start by putting the lanyard around your neck and blowing up the inflatable ball until it’s about the size of a grapefruit. Now grip your club, while keeping the inflatable ball between your arms. The goal is to keep the inflatable arm secured between your arms, unifying your arms and body, while making a normal golf swing. You may not be able to make a full swing with it, but that’s OK. Even a half or three-quarter swing will get your body to learn the motion. Arms and body working as one unit. The cost for the Tour Striker Smart Ball is under $40. Now, having an improved swing is a great start to lowering your score, but all the perfectly flushed 5-irons won’t mean a thing if you can’t putt. Poor alignment is by far the biggest reason people miss putts. The Quintic Putting Mirror will fix that. It’s exactly what it says, and we wrote about it in May 2016. It’s a mirror you set on the green and is about a foot long and six inches wide. The Quintic Putting Mirror has run lines on it and will help you line up your putter face to the ball, it’s also going to align you up with the target. Don’t assume the hole is the target, either. The hole where you want your putt to finish, but probably not where you want your putt to start. You can even put tees on the sides and back of the mirror to help you build a straight and accelerating stroke (as seen above). Repetition is one of the keys to success in golf. 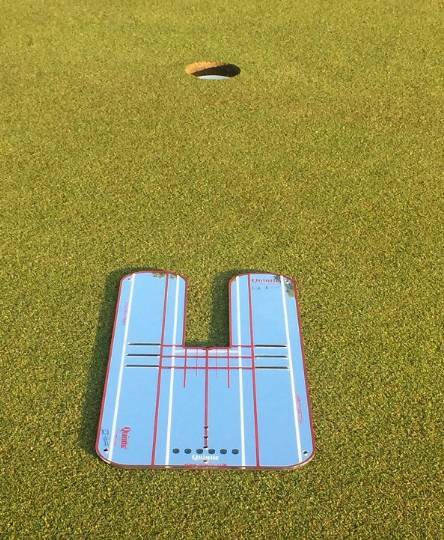 The Quintic Putting Mirror will build your confidence on the greens and you’ll no longer be lamenting all the missed putts you had from inside five feet. Buy one today from Paul Hurrion! If you polled professional golfers from all tours, the vast majority have used Tour Sticks sometime in their career. It’s the top homemade training aid used by tour pros everywhere. Take a peak at a PGA Tour driving range during a week on the Tour, you’ll see many, many sets of these in use. Tour Sticks are fiberglass rods you can use as a portable training aid to fix all sorts of swing issues. Lay them on the ground to check your feet alignment, or stick them in the ground to help tighten up certain aspects of your swing. 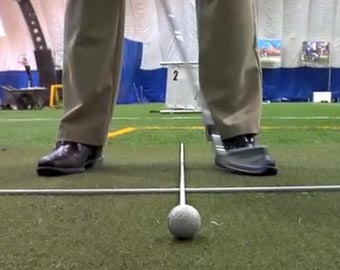 Either that, or use them in the drill called “The Tour Stick Drill,” developed by Todd Kolb. There is no limit to how you can use them, and they work for golfers of all ages and skill levels. They go anywhere you want to go on the practice range or course and can even be customized with your favorite color or logo too. Can’t ask for more than that from a training aid! Short game success is crucial in lowering your score. It seems inconceivable at times you could take two strokes to knock the ball nearly 500 yards towards the hole, and then take another four strokes to cover the final ten or so yards into the cup. Frustrating for sure, and absolutely fixable. What you need are Chipping Rings. They look like Hula Hoops, but smaller and thinner. They’re essentially different sized rings you put around the hole. 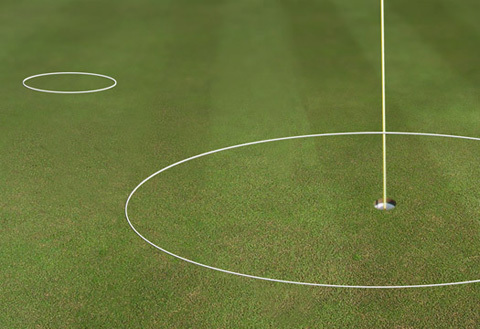 Honestly, you can put them anywhere on the green to help improve your chipping accuracy. The rings come in different diameters (ranging from 18 inches to 12 feet) and are thin enough so the ball rolls right over them without affecting the speed or roll of your chip shots. Best of all, they provide instant, 100% accurate feedback. 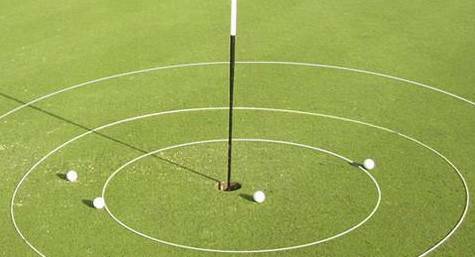 Did your chip shot land inside the ring? Great! Do it again. No? Keep trying until it does. See, chipping isn’t really about where the ball ends up. We learned this in Brandon Stooksbury’s book called “The Wedge Book.” Chipping is less about seeing where the ball ends up, and more about seeing where the ball is going to land. If you can land the ball in the right place, it will have a greater chance of ending near the hole. It’s a concept which is simple in theory, though sometimes hard to execute on the golf course. With chipping rings, any golfer can practice landing their chip shots where they need to. Soon, you’ll be hitting chips like this. The Golf Ring is very similar, as well. You can see these in the image above. 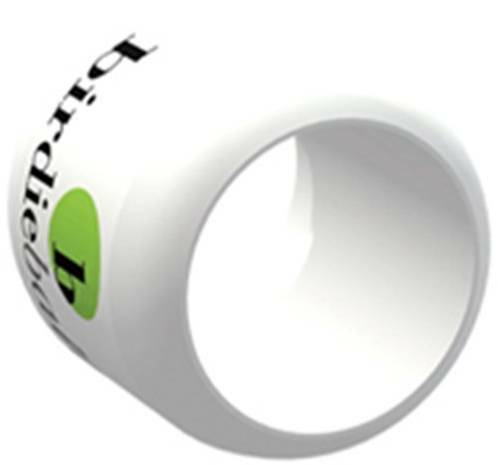 It’s a product designed to help you visualize a six-foot ring around the hole that creates a three-foot radius from the cup. If you want to take strokes off your game, get the ball closer to the hole! That’s no secret. You’ve already improved your putting from using the Eye Line Putting Mirror mentioned earlier, so now you need to get the ball close. Your confidence around the greens will skyrocket when you see yourself consistently chipping balls close. Buy a couple and use them to work on your precision to different targets on the green. The rings are fun, simple and easy to use. After all, we wrote about these back in 2012. Todd Kolb still uses them today. They’re that good. Maybe you don’t have the time to get to your local driving range a couple times a week or maybe your driving range is just too far from your house. That doesn’t matter if you have BirdieBalls. BirdieBalls bring the driving range to your backyard and you can work through your entire golf bag. They’re specially designed to only travel 40-50 yards, no matter what club you’re hitting. Hitting a real golf ball is great, but your neighbors won’t care for you smashing drives or 3-irons into their windows. Hitting a plastic or foam ball is worthless. 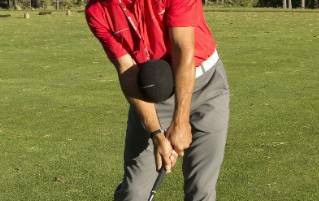 They’re too light, they don’t feel like a real golf ball and you can’t learn anything about your swing or know whether or not you made solid contact. BirdieBalls were named best new product at the PGA Merchandise Show, because they are next best thing to hitting a real ball. They don’t look like one for sure, but they act like one and that’s what matters. You can feel it when you hit one. Quite simply BirdieBalls are the best practice ball on the market. All of these homemade training aids are going to pay dividends with your game without you paying a lot of cash out of your pocket. Every homemade training aid mentioned can be had for under $40. If you play once a month that averages out a little over $3 a round. They fit easily in your golf bag and weigh less than your shoe. Heck, with the money you’ll be saving on golf balls and expensive lessons they’ll have paid for themselves after a month or two. Better scoring is possible with these homemade training aids. They work for major winners and club champions and they’ll work for you too. Try them out and spend more time on the fairway and green while you’re friends are hacking away in the rough and sand wondering what your secret is.